Professional FM bug spy transmitter, UHF Crystal Controlled listening device, 3-6V. Professional bug spy UHF room transmitter, powered by 2 x 3V cells, can be concealed anywhere in the room, it will transmit the conversation which takes place in a room with crystal sound quality and you'll be able to listen from distance, using our matching receiver or an UHF scanner. Very sensitive audio input they'll pick up voices or even rumors from long distance. The device's dimensions are less than 50% of others equipment. Easier to conceal. The antenna is much stable and rigid - less observed. Most of our equipment draws about 50% less current from the battery, so it lasts a longer time. Our transmitters are more powerful. Dimensions: 2.4cm x 2.2cm. 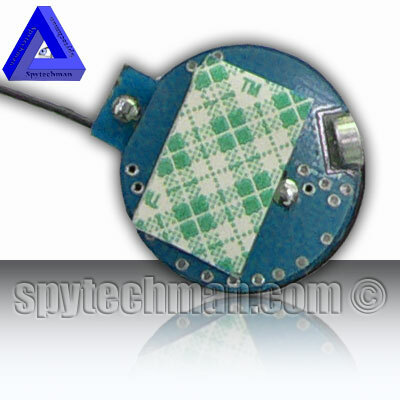 EXTRA SMALL listening device design, made for room surveillance and for places where the unit is difficult to conceal.. Stability: The only transmitter which has 3 Stages buffered output for stability. Distance: Long transmitting range (Up to 1/4 mile on clear, L.O.S.). Penetrates through walls and ceilings. Safety: The unique one using a patent pending material for encapsulating, for safety and security. Power: Up to 60mW RF output. Antenna: flexible wire 17cm full extended. Added double side sticking tape (3M genuine), so you may conceal and stick it almost anywhere! Just insert ONE or TWO Lithium batteries and it will begin to transmit. You can use high power batteries, as CR2450 or CR2032 LITHIUM battery . It will transmit up to 5 days using 2 batteries CR2450.